There has been some concern about poor fruit set in pumpkin fields that otherwise have healthy vigorous vines. This summer we have experienced above normal temperatures for much of the pumpkin fruit set season and I suspect that has played a role. 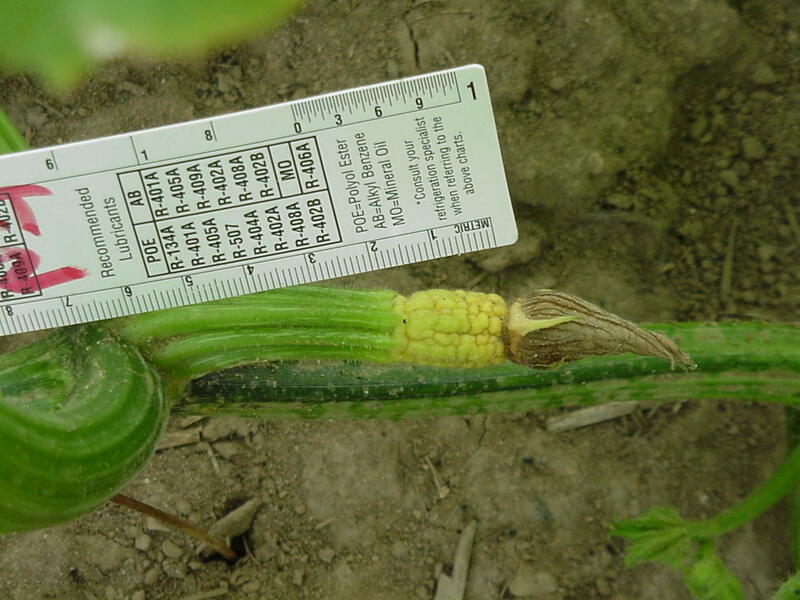 This article will consider temperature as well as other factors that influence pumpkin fruit set. In order for fruit set to take place, male and female flowers must be open on the same day, pollinating insects must be active, the plant must not be too stressed and it must have an adequate level of carbohydrates. Growers can influence some of these conditions. High temperatures promote death of female pumpkin flowers while still in the bud stage. Varieties differ in the their sensitivity to high temperatures. To determine whether flowers have died early in development requires close inspection of the pumpkin vine. An aborted bud often dries up and remains on the vine, but is only a few centimeters long and not easy to see under heavy vine growth (Figures 1 and 2). 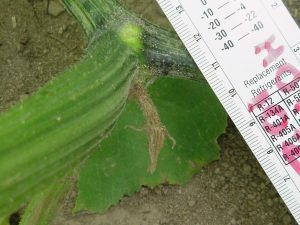 Nitrogen levels in the soil can influence pumpkin fruit set through effects on flower development. Excess nitrogen promotes vigorous vine growth but delays flowering. If the delay coincides with high temperatures, fruit-producing flowers may not develop at all until too late to produce much yield. Pumpkin flowers are usually pollinated by honey bees, squash bees, and bumble bees. Pollination occurs in the morning when flowers are open and bees are active. Multiple bee visits to a flower are needed in order to transfer enough pollen for fruit set. Each flower is open for just one day, and if a female flower doesn’t get pollinated on that day it will gradually yellow and fall off. To know whether bees are active in a field, take a look in the morning before it gets hot and flowers close. If bee activity is spotty and there aren’t any honey bee or bumble bee hives present, it may be worthwhile to bring hives in. Research in Illinois showed an advantage to having honey bee hives present for pumpkins. Work in New York indicated that the benefit of bringing honey bee or bumble bee hives in depends on the landscape within about 1.25 miles of the pumpkin field. Landscapes with more diverse plants and those with a higher percentage of “grassland” (fallow, weedy ditches, and semi-natural areas) did not benefit as much from supplemental bees. For a summary of the New York work, see The Decision-Making Guide for Bee Supplementation of Pumpkin Fields at https://ecommons.cornell.edu/handle/1813/43268. Whether relying on natural bee populations or hives brought in for pollination, careful use of insecticides is important to avoid harming the pollinators. Purdue publications about bees are available at https://extension.entm.purdue.edu/publications/pubs/bee.html. Table 10 in the Midwest Vegetable Production Guide for Commercial Growers has information about pesticides and bee safety. After pollination (when pollen is transferred to the female flower) pollen grains must germinate and grow to fertilize each ovule that will develop into a seed. Without this step, the seeds won’t start to grow and if seeds don’t grow the pumpkin fruit will die and fall off. If only seeds at one end or on one side of the fruit start to grow, the pumpkin will be lopsided. High temperatures can prevent proper pollen tube growth, and so even if flowers open and get pollinated, fruit may not set. Sometimes inspection will reveal flowers that have bloomed but not set fruit, and the aborted fruit is covered with a fuzzy mold (Figures 3 and 4). This is Choanephora fruit rot which can often be opportunistic; attacking fruit that was dying anyway. This is unlikely to be the primary cause of poor fruit set, and fungicides are not effective against this type of fruit abortion. Growing a pumpkin fruit and the seeds inside requires a lot of energy from the plant, along with water and mineral nutrients. Energy comes from carbohydrates produced by the plant through photosynthesis. If the plant doesn’t have enough energy, female flower buds and fruit may stop developing, yellow, and die. High temperatures, particularly at night, make the plant burn energy more quickly. Cloudy days mean less sunshine to supply energy for photosynthesis. This year, high temperatures in July coincided with rainy weather in portions of the state, so light was low when energy demand was high. Foliar diseases and too much shade from weeds also reduce photosynthesis and fewer carbohydrates are produced. There is evidence that shading the one leaf near a female pumpkin flower can reduce fruit set for that flower. Injury from herbicides can also stress plants and lead to death of flower buds. Generally, stressed plants, no matter what the cause, have low energy reserves. Figure 3. 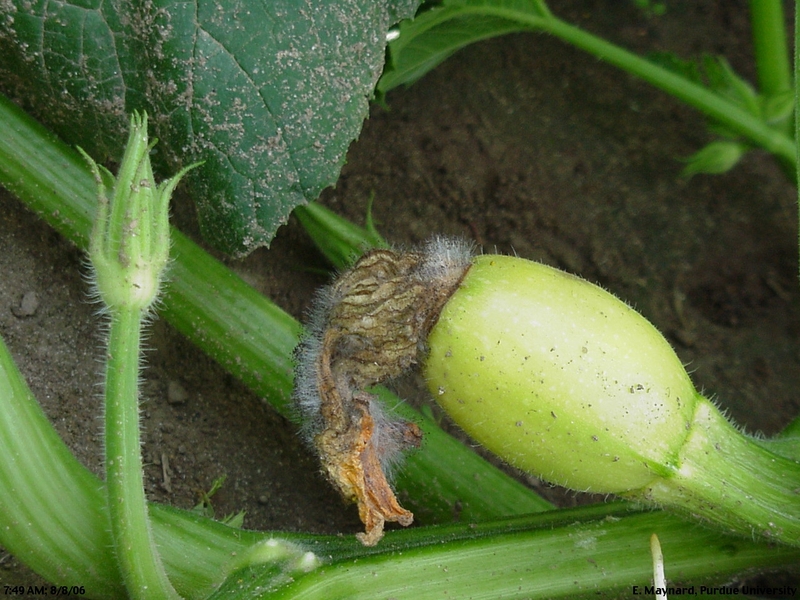 The fungus on this senescent female pumpkin flower (Choanephora sp.) is growing on a flower which did not develop properly. Figure 4. The fungus Choanephora sp. 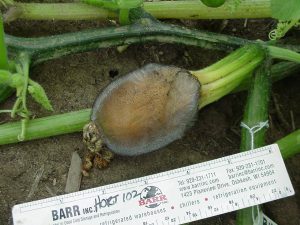 is growing on an female pumpkin flower that failed to develop. Basic good management practices will help the pumpkin plant meet the energy demand of growing fruit. In dry conditions irrigation is likely to be important. Weed control is important, not only to avoid shading, but also to reduce competition for water. If uneven emergence and plant size make normal cultivation difficult or less effective at eliminating weeds, hoeing or hand-weeding, or spot treatments with herbicides may be warranted. We have observed no diseases that cause the symptoms of poor fruit set described in this article. If you think you may have a disease, contact the Purdue Plant and Pest Diagnostic Laboratory or the authors of this article. These are the basics of what we know about pumpkin fruit set. For cases where fruit set was an issue this year, hopefully one or more of these factors will be a reasonable explanation, and one can begin to consider what might be done differently next year, if anything.